More Than Happy: The Wisdom of Amish Parenting (by Serena Miller and Paul Stutzman) has actually been out a few months already. We took a brief look at this book in a previous post (“Are Amish Children Happier?“). I should say I’m not surprised to see a “how-to” book on Amish parenting. I’ve always thought this would be an attractive topic, given outsiders’ positive impression of Amish children, and how important parenting is. Promote Hospitality – It’s hard to be lonely with family and friends always around. Make Chores a Family Thing – Including young children makes them feel like needed contributors. 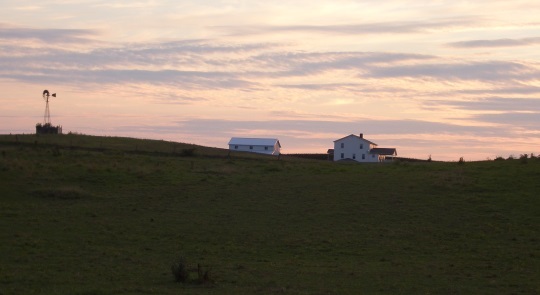 Instill Uffgevva – A dialect word described in The Amish Way as a “self-surrender” which involves yielding to community authority and God’s will. Uffgevva promotes thinking of others first. Keep Family First – A large, intact family is the “stable foundation” which should come before individual desires. When I wrote my book on Amish business people’s success ideas, I tried to keep in mind that not everything is perfectly repeatable in a non-Amish context. In the case of raising children, I’d think that some features of the culture would also be hard to reproduce outside of it. For example, the large families, extensive community support, and uniform belief system. Or for that matter, the acceptance of physical discipline, which seems to be falling out of favor in parts of society–but remains a reality in Amish homes (and even schools). Parents especially, what do you think? Did these tips resonate with you? Would you add anything to this list? 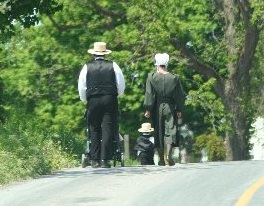 Image credit: Family walking- Ed C.
I’ve read a few books on Amish practices, such as child rearing, and I love them. Reducing technology is key, I think, because it pulls us away from everything else. My husband and I didn’t have television for the first year of our marriage, then we started watching it just once in a while so he could watch football. Honestly, I didn’t like it. He seems to turn into a different person. Then, we started watching this show and that show and soon, we were watching things that I would never want my daughter to watch. When she started staring at the television like a zombie, that was it. We traded the television for a laptop computer (I’m a writer) and don’t miss it in the least. My daughter (she’s 11 months) has started sleeping through the night pretty consistently since. The rest are all very key, too, but I think they can all fall apart when technology invades. Before technology, people stayed close together in their communities. Then people started spreading out. I have family all over the country because of people moving for jobs or just because they want to. It’s become so much easier to just pick up and move. Hospitality is huge. I think we’ve become too isolated. It’s too easy, like now, to just talk to people on the computer. But you lose so much of the relationship that way. Even just talking on the phone detracts from a relationship. I actually hate talking on the phone because you can’t see facial expressions or body language. I think the hardest one for me is self-surrender. We were just raised differently. To me it became tantamount to being a doormat, and so now, I have the hardest time surrendering my entire life to God. As far as surrendering to community, we just don’t have such a thing, which I think is very tragic. The closest we have is church, but when you only see church family 1-2 times per week and you don’t live close to each other and visiting just isn’t a thing because your lives are all so busy, community isn’t really community. I’d always thought I wanted to move somewhere close to the Amish, but my thinking has evolved a bit. There’s a problem that needs to be fixed in our modern society. Neighbors don’t know each other anymore. We need to get out there and form community. Plan a block party and invite the neighbors, having the city close off your street to through traffic for the day. Or even just getting out to know your neighbors. Make a visit. Invite them to church. Let’s start a revival of community. Thanks for this great comment Amy. I appreciated reading about your TV experience. I don’t have one but sometimes visit homes which do. It is easy to get sucked in to staring at the screen. Even if you just watch quality programs, it can still be a big time-eater. I am actually very much with you on talking on the phone. I also dislike it for the same reasons. It feels like two-thirds of a conversation. I think I pay attention to non-verbal a bit more than is typical and maybe that’s why I tend to dislike phone conversations (to clarify, it’s not that I don’t like being in touch with someone over the phone if that’s the only way to make it happen, it just feels like a chunk of the experience is missing). Good point on community too. I just don’t think the average non-Amish person has close to what the Amish have in terms of community support and resources. We do create artificial “communities” online for instance, and I think that suggests a deep need/craving for belonging to a group. Too bad I can’t find people like you in my neighborhood! Can you suggest any good Amish parenting books? I’ve read these: Amish Values for your Family by Suzanne Woods Fisher, Amish Peace by the same author, and Plain Wisdom by Cindy Woodsmall. They aren’t all necessarily on parenting, but they have a lot of good information that is family oriented. In my early years 1950s there was family and community. WE knew our neighbors and our aunts, uncles and cousins gathered on Sunday at our grandparents house to share a meal and recreation. That pretty much carried on into my early teens, 1960s, until we moved 1000 miles away from family and friends. The immediate family continued Sunday dinner together and eating at a table, not in front of TV. I had 7 siblings so I didn’t feel alone. But slowly we children married and moved on. We scattered across three states and family dinners only happened occasionally on Thanksgiving. Fast forward to today. I am a widow, alone and spend many days without speaking to anyone except on the phone. Some days I wonder, if I died how long would it be before some one found my body? Because of the Amish sense of family and community they never need worry or ask that question. As for electronics. My biggest time waster is not the TV but the internet. I belong to quite a few online groups. This makes me feel like I am part of a group as you said Erik, But, it pales in comparison to real human contacts. I was taken by #5, keeping family first. My married daughter (9th anniversary coming up July 7), her husband, and their 2 little girls (2 and 4 years old) visit us for Sunday dinner twice a month. They were over last Sunday, and my daughter emailed me what her older daughter told her after they left our house—“I love going to Grandma and Grandpa’s house (we have nicknames, actually). I could go there night after night!” That nearly brought me to tears, and I told my daughter so. Her reply was that she was glad her husband wanted to buy a home close to both sets of grandparents (etc. ), to be able to visit each other regularly because it means a lot to them. That was so good to hear, because most of my friends’ kids have moved to other cities and many are now out of state. They tell me how much they miss seeing their kids, grandkids. I truly feel blessed that my kids are so close! We may not have a huge family like the Amish, or belong to a large community or church that is “close”, but I’m sure we value our family “closeness” very much like the Amish do…that’s one thing I absolutely agree with! Yes, these tips reflect my own upbringing, but I would add to number 4 by saying the German culture also includes the teaching of “Keep in step.” We were expected to abide by the rules and teachings of the elders. Rebellion was any time you got “out of step” with what was expected, and you were quickly brought back in line. “While spending money upon oneself does nothing for one’s happiness, spending it on others increases happiness,” according to researcher Mike Norton. This reminds me of the song J-O-Y, Jesus first, others next, and yourself last. Uffgevva to me means giving up. Not the “I give up and won’t try anymore.” But the “I give up my will and ideas for yours.” Children can be taught that they can’t always be the one choosing which game to play. When four people are travelling in a car and it’s time to eat, someone will have to give up their choice of a place to eat. It is unhandy if everyone is so Uffgevva, that no one will say where they would like to eat!